Italian Connection specializes in offering travelers with hand-crafted guided cultural, culinary, and walking tours in Italy and beyond. When it came time to revamp their website, Italian Connection partnered with Mannix Marketing to showcase their variety of tours and drive traffic to their website. 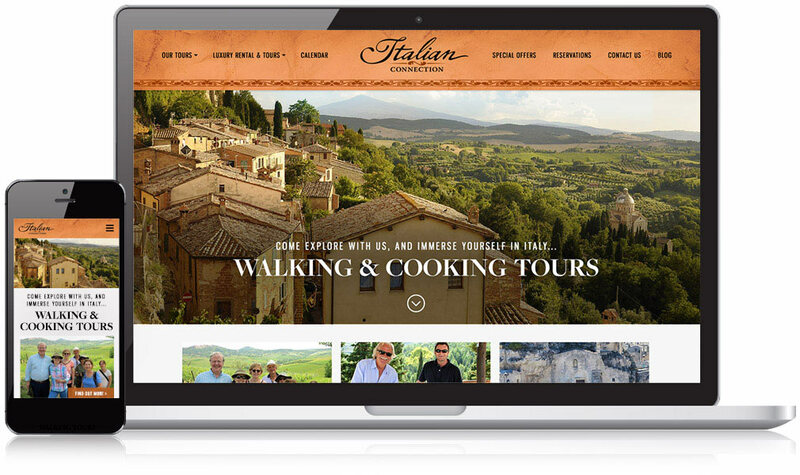 Italian Connection needed a modern website that showcased their vast variety of award-winning walking tours. Unlike their previous website, Italian Connection’s new website delivers a clear and concise sales pitch through its informative and easy-to-read design, comprehensive display of services, and clickable calls-to-action. Undergoing a complete transformation, Italian Connection’s new website has a contemporary, welcoming design enhanced with their unique European character. Beautiful and bright photos of Italy’s landscape greet website visitors front and center to instantly set the tone. An easy navigation bar and dynamic layout provides user-friendly tools to learn about their variety of services. Italian Connection’s website was designed with the marketing goal to keep visitors engaged and on the page. Unlike their previous website, the new design prominently features their expansive offering of one-of-a-kind tours right on the homepage in an easy-to-read layout. Visitors can quickly skim the breadth of options with direct links to individual pages to learn more about each type of tour. In order to convert website visitors into potential customers, our expert programmers displayed prominent call-to-action buttons and trust symbols. Visitors are strategically guided to click the “Plan Your Tour Now,” “View Calendar” and “Sign Up for E-News” buttons, while the featured Gourmet Magazine testimonial and “As Featured in 50 Tours of a Lifetime by National Geographic Traveler” graphic showcase Italian Connection’s national acclaim. These dynamic design features reinforce the goal of getting website visitors to contact them. Since the website went live, Italian Connection has seen an 85% increase in website traffic. Looking to reach travelers with your travel website?